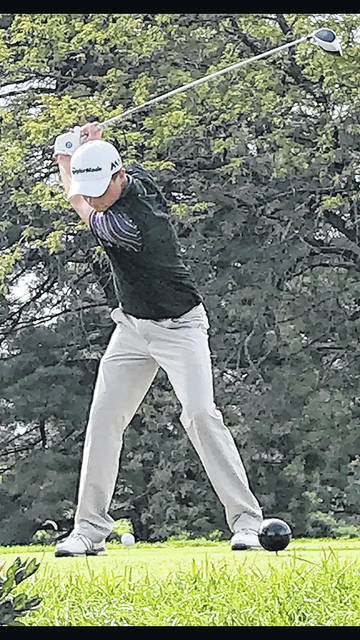 Butler’s Austin Greaser, pictured in file photo from last season, shot a 69 in the first round of the Greater Western Ohio Conference tournament on Thursday at Beechwood to claim the top overall qualifying spot. The second day of competition is scheduled for Saturday. ARCANUM — Butler’s Austin Greaser was the top overall qualifier during the first day of competition at the Greater Western Ohio Conference Tournament held at Beechwood Golf Course in Arcanum. Greaser fired a 69 to lead Butler to a tie for fifth place overall finish with a team sore of 327 which tied the Aviators with Troy. Niels Princi fired an 83 to also qualify for the second day of competition. The top four teams and 16 individual qualifiers advance to Saturday’s second round. Michael Brandt tied for the 16th and final qualifying spot, but the four-way tie used a scorecard tie-breaker using the fourth hole score that instead sent Northmont’s Brayden Hobert to the second day of competition instead. Rounding out the Aviator team was Jestin Love and Ben French with a 91 and Ethan Sanderson with a 92. The second round of competition was slated for Saturday with the results too late for this edition. Butler will next play in the OHSAA Sectional Tournament on Wednesday at Yankee Trace Golf Club in Centerville. The tournament is slated to begin at 9 a.m.